Wan "Hikari no yukue": Teabowl "Whereabouts of Light"
4 x 4 x 4 1/2 in. Wan "Kaihō": Teabowl, "Ascetic（Ninja) on the thousand-day walk through the mountains"
4 1/8 x 4 1/2 x 4 3/4 in. Wan "Mitsu no mitsu": Teabowl "Secret Offering"
3 3/4 x 4 3/4 x 4 1/2 in. Wan "Amaoto no koe": Teabowl "Sound of Rain"
4 x 4 1/2 x 4 1/2 in. NEW YORK – Three rising stars in Japanese contemporary ceramics will make their debuts in New York City this September at Joan B Mirviss LTD. The exhibition will showcase three young artists in their first solo exhibitions in the United States. Hattori Makiko, Kino Satoshi, and Takemura Yuri have each chosen a highly independent, creative approach to clay that challenges the centuries-old, established traditions of Japanese ceramic art. In the dozen works created for Inside Out: Meditative Forms of Hattori Makiko, the artist has created a captivating body of work that commands close-up viewing with her incredibly intricate, sensuous, yet surprisingly sharp surfaces. Confronting the historically significant art of celadon-glazed porcelain, Kino Satoshi tackles this esteemed tradition with his highly original approach in Quiet Tension: The Sculptural Art of Kino Satoshi. Takemura Yuri, in Dancing Colors of Takemura Yuri, takes the concept and form of the revered Japanese teabowl in a totally new and delightful direction. With contemporary sculptural forms, exquisite glazes, painstakingly intricate and challenging techniques, and refined aesthetics, these three artists have become the young leaders of the next generation of Japanese clay artists. HATTORI MAKIKO (b. 1984), born in Mie Prefecture near the city of Nagoya, studied ceramics at university, where she was seduced by the softness and sensuality of clay. Her swirling, densely packed sculptures are completely covered, both inside and out, with thousands of tiny bundles of ribbon-shaped clay shavings applied with a thin needle. This exceptionally meticulous and time-consuming method requires a form of rhythmic repetitiveness in which the artist finds personal serenity. As these completed works contain a significant amount of clay, intricately adhered to all of the visible surfaces, they can take up to six months to dry properly. Hattori then chooses to leave her forms unglazed in order to highlight the intricacy of her process and artistic vision, producing sculpted surfaces that are evocative of sharply defined flower petals, coral, and even whipped cream. Her work is featured in the collections of a number of prominent museums, including the Minneapolis Institute of Arts, MN; Paramita Museum, Japan; Taipei County Yingge Ceramics Museum, Taiwan; and Victoria & Albert Museum, UK. KINO SATOSHI (b. 1987) was born in Kyoto, where he first began working with clay as a teenager. At Kyoto Seika University, he originally intended on studying stone sculpting until he was exposed to the powerful porcelain sculptures of Nishida Jun (1977-2005), who had attended and lectured at thatuniversity. With more exposure to the possibilities of the medium of clay, he grew fascinated by the strength of fired porcelain and began creating attenuated, billowing, ribbon-like, hand-built sculptures of porcelain that are intended to integrate with and confront their surrounding space. Kino’s use of the pale bluish-green seihakuji glaze is inspired by his fascination with the phases of the moon. His works can be found in Asian museums including the Fuping International Ceramic Museum, China; Museum of Ceramic Art, Hyogo, Japan: New Taipei City Yingge Ceramic Museum, Taiwan; and recently have begun to be acquired by Western museums. TAKEMURA YURI (b. 1980), the daughter of a graphic designer who inspired her to study art and oil painting, is from Aichi Prefecture where she attended the local university and explored painting on three-dimensional ceramic forms. After moving to the art-center of Kanazawa, she was exposed to the ancient local tradition of polychrome glazing, and soon her bold, colorful palette together with stylized patterning became her signature aesthetic. Her highly sculptural teabowls reflect the artist’s sense of playfulness and keen sense of design and color that stretches far beyond their obvious functionality. 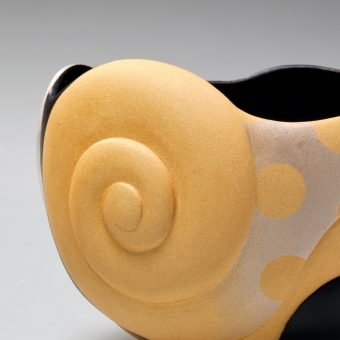 The smooth, curving surfaces complemented by geometric bands of matte color, linear designs and glistening gold or silver, separate her teabowls from the work of any other artist. Takemura sees them as a visual recording of her daily life, expressions of her inner self. Despite her young age, she has received an impressive array of awards and accolades. Her work was featured in the Japanese Kogei: Future Forward exhibition at the Museum of Art and Design, NY in 2016 and has begun to enter institutional collections such as The 21st Century Museum of Contemporary Art, Kanazawa, Japan and the Portland Art Museum, OR. For further information or images, please call 212-799-4021 or email admin@mirviss.com.